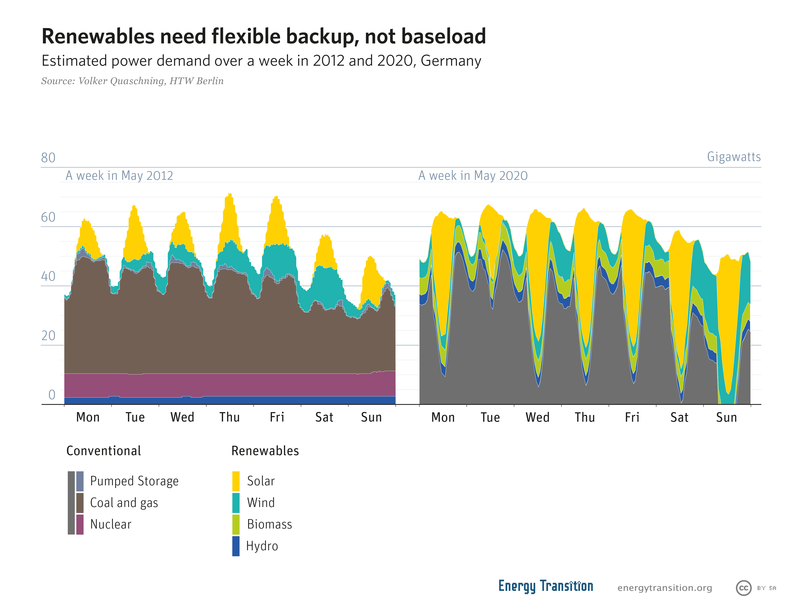 As solar and wind surpass coal, the German energy grid desperately needs to adapt. If it’s not flexible, the energy transition will be stalled, says L. Michael Buchsbaum. The numbers are in. Renewable energy sources increased their output in Germany by fully 10% between the first half of 2018 and the same period last year, raising their share of power generation from 32.5% to 36.3%. Moreover, during the first half of 2018, wind and solar, combined with other renewable resources have, for the first time, fully overtaken both brown and hard coal as Germany’s main electrical power sources. But as green power output has grown by a third over the last three years, a question hangs in the air: will Germany’s fractured leadership adopt a plan to integrate the rising amount of renewables into a re-imagined grid? Or will their dithering instead continue to slow the Energiewende’s progress? Data released by the German Association of Energy and Water Industries (BDEW), the sector’s leading lobbying group representing utilities like E.On and RWE, shows that wind, solar, and other renewable energy sources together generated 118 billion kilowatt hours (kWh) of electricity between January and the end of June. In comparison, lignite and hard coal only generated a combined 114 billion kwh over the same period. While just a short lead, for planners it should mark a major paradigm shift about how one considers Germany’s current and future energy capacity. Over the last twelve months, onshore wind saw the biggest increase of all renewable sources based upon gross energy generation, surging in output from 12.5 to 14.7%. Conversely, power generation from hard coal dropped like a proverbial stone, from 15.6 to 12.6%. Though later this year, Germany’s last hard coal mines are scheduled to close, emissions-laden lignite, mined domestically, continues to carry the heaviest load, albeit decreasing ever so slightly from 22.9 to 22.5%. While gas also fell by more than 1% to 12.3% of the gross power mix, nuclear energy actually grew by a point to 11.3%, according to the new BDEW figures. Germany’s nuclear fleet, however, remains on schedule to be phased out by 2022. According to additional figures released by the Freiburg-based energy institute Fraunhofer ISE, over the first six months of the year renewables provided 41.5% of all power, up 4% over last year’s figure of 37.6%. As data released on their Energy Charts website shows, from January through the end of June, 113 terawatt hours of electricity was provided by all renewable technologies. Reflective of its surge, wind turbines provided the largest amount of renewable power, over 22.2%, followed by biomass at 8.4% and solar pv at 8.2%. The rest consisted of hydropower. Combined, this is also the first time the country’s renewable energy supply has topped 100 billion kWh over a six-month period. Conversely, in terms of its overall generation share, coal-fired power fell by 10% to around 114 billion kWh, as its share of total power generation fell to 35.1%, compared to 38.5% in the first half of the previous year. Now that renewables have surpassed the capacity of the same fuel source that powered Germany through the Industrial Revolution and its post-war economic rebirth, it’s vital to develop a new grid, predicated upon an emerging renewable energy matrix in order to unleash this maturing technology’s full potential. In a press release announcing the figures, BDEW head Stefan Kapferer celebrated that “renewables are on the march.” But he also emphasized that now “what is needed more than ever is to accelerate grid expansion” to mitigate the intermittence of renewable power sources, while balancing this with an ever-diminishing amount of base-load capable fossil and nuclear plants. He also warned that Germany still lacks a reliable backup or reserve energy system to compensate for periods of low renewable energy output, and added that this problem is set to intensify as more coal plants are shut down. Indeed, roughly 50% of current coal-power capacity must be removed from the grid by 2030 to meet the energy sector’s carbon pollution reduction target, according to the Economy and Energy Ministry. Renewable integration into the grid as well as the need to essentially rebuild much of the existing transmission systems may yet prove the Energiewende’s Achilles heel. Already members of the nation’s Coal Commission tasked with developing a workable coal exit strategy as well as members of the nation’s shaky Grand Coalition Government have seized upon this as a way to slow down the surging pace of renewable energy adoption. Ironically, E.On, one of Germany’s biggest energy firms and once a fierce critic of the Energiewende, simultaneous to BDEW’s announcement put out a press release through its sales team touting the fact that the aggregate 104 billion kilowatt hours (KWh) of clean energy produced by the end of June was enough to power every household in the country consuming an average of 2,500 kWh usage for a year. Although that’s not really how the relationship between generation and consumption usually works, renewables have managed to shoulder 100% of the energy load twice this year: once on New Year’s Day and again on May Day. Just imagine what renewables could do if they had a grid properly designed around their needs and not still mostly captive to those of the fading coal industry! The Energiewende needs no grid extension, just the opposite. Decentralisation and grid defection are already taking off.